Description - Our recycled rubber interlocking zip tiles offer a low cost solution for commercial grade rubber tiles that are also well suited for the home user. These tiles are die punched tiles and each tile is a center cut tile meaning locking tabs are found on all four sides of the tile. Some cutting of the tiles is often required to square off the edges and that is why we often recommend purchasing 5-10% more tiles than it takes to actually cover the desired area. Cutting of these tiles to custom fit them to your room can be easily done with a utility knife and straight edge like a yard stick or ruler. The tiles are safe to use outdoors although the color flecks can fade in direct sunlight over time and no adhesive is required to install these interlocking tiles. Material – Recycled crumb rubber and colored EPDM virgin rubber flecks. Recycled crumb rubber is a low cost recycled rubber derived from recycled rubber tires. It is designed to be very durable and cost effective. Size – 28.5" x 28.5"
Weight – 10 Lbs or 12 Lbs per tile depending on thickness. Recommended Uses – Zip rubber tiles have been used successfully in home gyms and weight rooms, commercial gyms, as both a permanent and temporary flooring for use in areas where ice skates and spiked shoes are used, as trade show exhibit flooring, at doggy day care facilities and dog parks, kid’s play rooms, around pools , decks, and patios to help prevent slipping in areas that frequently get wet, etc. Vacuuming any loose crumbs, dust, or debris from the tile surface when necessary. Periodic damp mopping of the rubber floor tiles with a mild soap and water mixture. Some soaps commonly used include Dawn dish detergent and/or Tide laundry detergent. Available in 8mm or 3/8" thicknesses. Standard 17% color fleck means you get more for your money. East and West Coast shipping options. The room we wish to convert to a home gym has a hardwood floor. Is it safe to install the tiles on hardwood? The room is not near a wet area but wondering if condensation under the tiles is a common problem? Don't want to warp the floor. Thank you! Our Zip Rubber Tiles can be placed over hardwood flooring. The tiles do not sweat, but if there is moisture coming from the subfloor, you would see condensation on both the rubber tile and the wood flooring. If you do see condensation occur under the tiles or on the wood, you will want to get your subfloor looked at immediately. This is a sign that moisture is coming up from the subfloor and that it needs to be sealed or repaired. What are differences between the 4 types of 8 mm tiles that explain the price differences (Zip, Strong, Strong-Designer, and Eco-lock)? Our Zip Rubber Tiles are a larger tile that features a high level of color. Our Zip Rubber Tiles only come as center tiles, so you will have to cut them to create corner and border tiles. Our 8mm Strong Rubber Tiles have a little less color than our Zip Rubber Tiles. These tiles do come in corner, border and center tiles allowing you to easily create a finished floor. Our 8mm Strong Rubber Tiles - Designer Series have the highest amount of color which is why they are the priciest of the bunch. These tiles only come in a center tile, so you will need to cut them to create corner and border tiles. Our Eco-Lock Rubber Tiles have the same amount of color as our 8mm Strong Rubber Tiles, however they feature two removable edge pieces. This allows you to create border and corner tiles with ease, but it will not look as seamless as our 8mm Strong Rubber Tiles. Our Zip Rubber Tiles, 8mm Strong and Designer tiles all come from both coasts, whereas our Eco-Lock Rubber Tiles only come from the west coast. Do you have rubberized soundproofing tiles for a bedroom floor? Our Zip Rubber Tiles or any of our rubber flooring will help to reduce the amount of noise transferred from floor to floor but is not considered a soundproofing product. You still will get some sound transmission, but it will be greatly reduced compared to a hard surface product. Can I use the rubber tile for outside on top of concrete? You can use our Zip Rubber Tiles outdoors. These tiles are weather resistant and are very easy to clean and maintain. They are very slip resistant even when wet and are mold and mildew resistant. The only thing that you will notice is that the tiles will fade in direct sunlight. Easy to install, quality look. Took half day to install 400 sq ft. of tile in space requiring many angle cuts. No problem. I bought one of these tiles to use under my Bowflex Select Tech dumbbell rack. It works!! I only wish they had inserts to make the jig saw puzzle part of it look as if it was finished. I guess you could cut it, but it's pretty thick and that would reduce the size of the mat by about an inch on each side. I'm very pleased with this purchase. I received the product as scheduled and delivery was right to my door. After a very brief review of the interlocking border scheme I was able to lay out the floor and install it with relative ease. 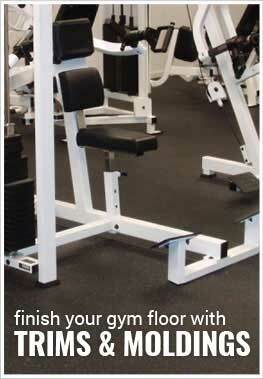 I looks great in the room and I am very satisfied with this solution for my home gym flooring. Zip Rubber Tiles are the best! !